Interstate 64 connects the St. Louis metropolitan area east to the Hampton Roads area of southeast Virginia. Along the way, I-64 connects with Mount Vernon, Illinois; Evansville, Indiana (via former Interstate 164/new I-69); Louisville, Kentucky; Charleston, West Virginia; and Richmond, Virginia. Interstate 64 doubles as the southernmost extent of the Avenue of the Saints corridor between Wentzville and Lindbergh Boulevard (U.S. 61) at Ladue. Although much of the Avenue of the Saints corridor north of I-64 and I-70 consists of four-lane divided highway or expressway, it is not an Interstate route. The corridor extends north from the St. Louis area to Hannibal, Iowa City, Iowa and ultimately St. Paul, Minnesota. 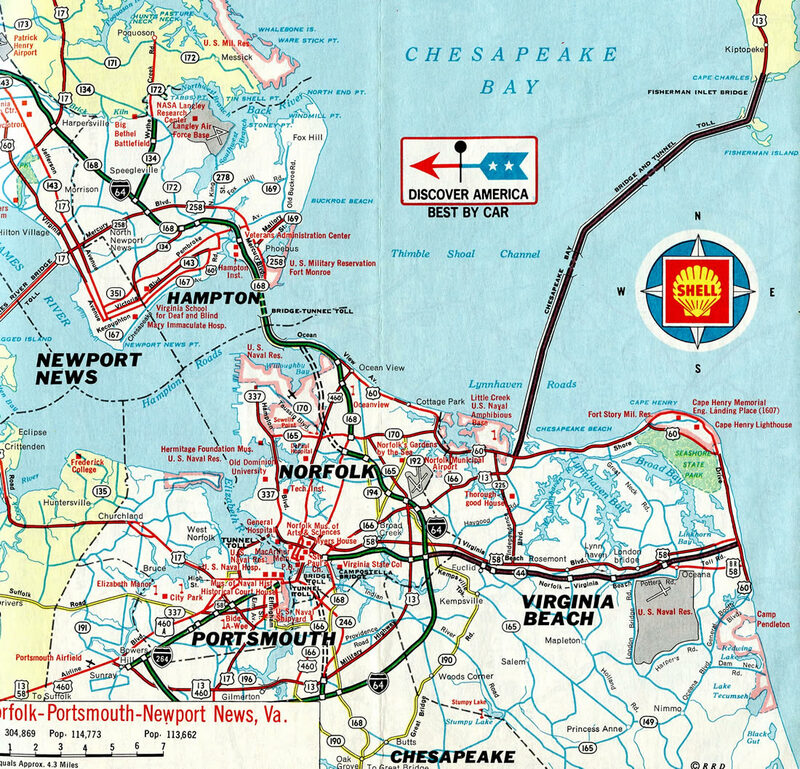 Together the easternmost 35 miles of Interstate 64 and all 20 miles of Interstate 664 constitute the Hampton Roads Beltway. A distinct trailblazer is used for the Beltway, with directional placards indicating inner or outer depending upon the direction traveled. Furthermore the portion of I-64 between I-264 and 664 at Suffolk and I-264 at Virginia Beach does not use cardinal directions due to the orientation of the freeway. Interstate 64 and U.S. 40 & 61 are merged from the western terminus at Wentzville to Ladue, where U.S. 61 turns south along Lindbergh Boulevard. I-64 and U.S. 40 remain cosigned to St. Louis and the Poplar Street Bridge across the Mississippi River. I-64 and U.S. 40 part ways at the East St. Louis Interchange, with U.S. 40 taking I-55 and I-70. East of St. Louis, Interstate 64 replaced former U.S. 460, which used to follow portions of Illinois 15, 142, and 14 and Indiana 66 and 62 en route to Louisville, Kentucky. The route also overlaps with U.S. 50 from Caseyville to O’Fallon, Missouri. Once at Louisville, Interstate 64 parallels U.S. 60 more or less east to Virginia. 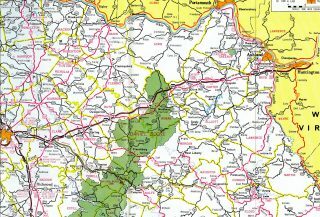 Exceptions to this include the toll section where Interstate 64 is combined with Interstate 77 (West Virginia Turnpike) and between Staunton and Richmond, where it parallels U.S. 250. Interstate 265 Connector/East End Bridge — Cost: $1.29 billion; Estimated Completion: 2013. Interstate 65 Downtown Louisville Bridge Replacement — Cost: $868.4 million; Estimated Completion: 2019. The Abraham Lincoln Bridge opened to traffic on December 6, 2015. Interstate 64, 65, and 71: Reconstruct the Kennedy Interchange — Cost: $1.74 billion; Estimated Completion: 2024. The original western terminus was in Illinois at the East St. Louis interchange with Interstates 55 and 70. Interstate 64 was extended westward in 1993 from East St. Louis through St. Louis to Interstate 270 at Town and Country, Missouri via the Daniel Boone Expressway (U.S. 40). Further extension west into St. Charles County followed through a series of upgrades to the Daniel Boone Expressway (U.S. 40 & 61) to Interstate standards. Interstate 64 ended in Chesterfield just ahead of the Daniel Boone Bridge spanning the Missouri River. Photo taken by Rich Piehl (11/00). The west end of I-64 was located at the approach to the U.S. 40-61 bridge over the Missouri River until 2003. Upgrades continued westward to the Missouri 94 interchange, and then Highway K in 2004.2 The last section, which opened during a ceremony held at the new interchange at Prospect Road on October 14, 2009, extended Interstate 64 northwest to Interstate 70 in Wentzville. Interstate 64 underwent major improvements in the St. Louis area between 2000 and 2009 as part of the “The New I-64” construction project by MoDOT. I-64 between Ballas Road and Interstate 170 was closed for reconstruction between January 2, 2008 and December 31, 2008. The stretch east from I-170 to Kingshighway Boulevard faced a similar closure on December 15, 2008, as the western section reopened. The entire project was completed on December 7, 2009. The project redesigned the 1950s-built freeway to modern standards, with new overpasses, redesigned interchanges and a high-speed connection with I-170 in addition to landscaping and architectural improvements. The original corridor planned for Interstate 64 between St. Louis and Louisville followed the recognized major routing of U.S. 50 from St. Louis to Shoals and U.S. 150 from Shoals to Kentucky. The route between Louisville and Lexington was selected due to the introduction of Interstate 71 between Louisville and Cincinnati, and earlier stages of the Interstate system planning called for just a two-lane route from St. Louis to Louisville. The initial proposed route of Interstate 64 along the U.S. 50 corridor across southern Illinois in 1960. U.S. 50 was the main route between East St. Louis and Vincennes, and the state of Illinois planned to construct a four-lane divided highway along the corridor in the 1940s. World War II delayed construction and offset potential reconstruction of the route in Indiana, while U.S. 50 and 150 further deteriorated during the war as part of the strategic highway network. The corridor became a part of the Interstate System in 1947, with Indiana calling for a new route from Vincennes to Cincinnati for U.S. 50. The Indiana state Highway Commission submitted strip maps of the U.S. 50-150 corridor from Vincennes to New Albany as the proposed alignment for Interstate 64 because of the necessity to meet the Bureau of Public Roads deadline of January 1, 1957 for all general Interstate route alignments. Construction to expand U.S. 50 to four lanes from Vincennes to Lawrenceville was incorporated into Interstate 64. Contracts for this work were let in 1956 and 1957. Illinois and Indiana also submitted an agreement to the Bureau of Public Roads to construct the I-64 bridge across the Wabash River, north of Vincennes, on April 7, 1958. This was approved on June 12, 1958, with work commencing soon thereafter. The date of formal approval for all Interstate system routes set by the Bureau of Public Roads was June 30, 1957. Indiana followed this deadline with comparative studies on a more direct alignment between Vincennes and New Albany, including a straight line running about ten miles south of Washington. The consideration of several alternatives, including more southern routes, attracted the attention of local interests. Local Chambers of Commerce and civic groups formed two major factions, with one favoring the original northern route through Vincennes and another supporting a southern alignment closer to Evansville. The formation of Southern Illinois Incorporated, an association of community development groups, in 1957 led to the announcement of Indiana Governor Handley that both Illinois and Indiana were considering shifting the I-64 corridor southward to serve a greater population base. Despite efforts of the northern proponent group, the St. Louis – Vincennes – Louisville Interstate Highway Committee, which were slower to organize than those to the south, Governor Handley formally announced on February 12, 1958 that I-64 would take the southern course toward Evansville. The St. Louis – Vincennes – Louisville Interstate Highway Committee continued to lobby for the northern alignment of I-64 after the 1958 announcement, garnering support from Chicago newspapers as well. 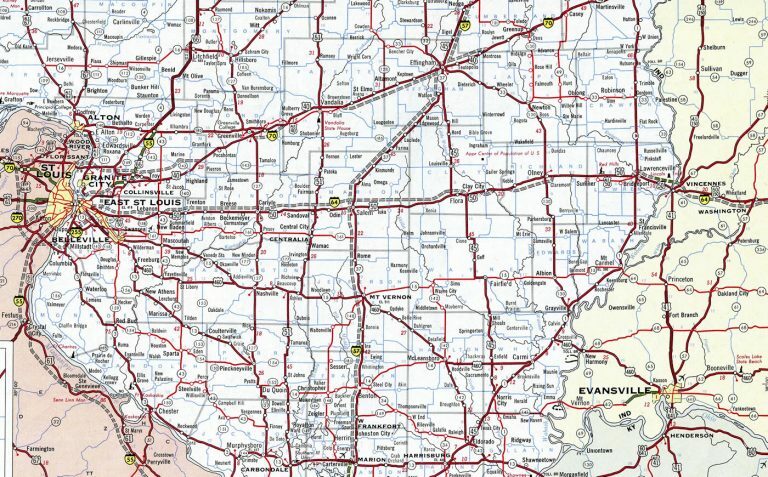 However Illinois Governor Stratton and the Chairman of the Indiana State Highway Commission sent a formal recommendation to the Regional Office of the Bureau of Public Roads recommending the southern corridor on May 19, 1959. This was based upon documentation on the original and southern corridor comparisons made by the Illinois and Indiana State Highway Departments. Subsequent actions by the Chief Highway Engineer of Illinois and the Chairman of the Indiana State Highway Commission reaffirmed the southern route with separate requests to the Bureau of Public Roads on February 4, 1960. 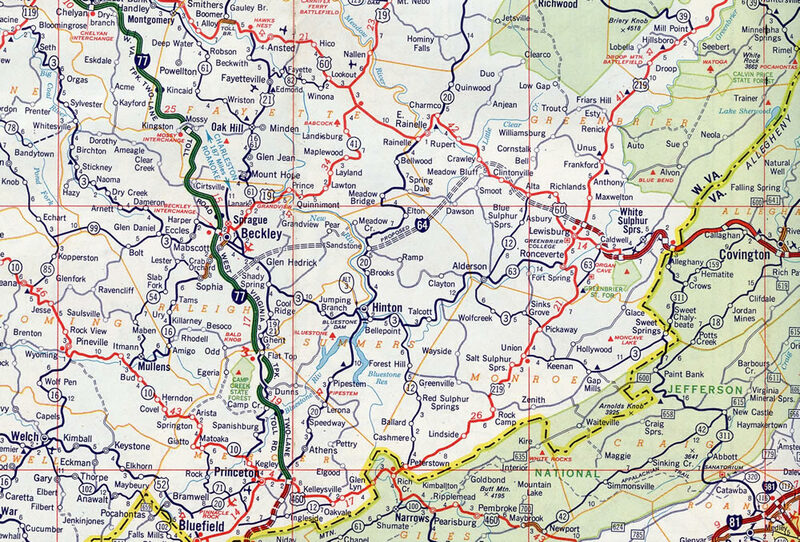 After three days of public hearings involving the two major factions, the Bureau of Public Roads ultimately approved the southern alignment due to the two states agreement in late 1960. Governor Stratton maintained that Illinois would continue to upgrade U.S. 50 to a four-lane limited access route in September 1960. Indiana started construction on the U.S. 50 Vincennes bypass by 1963 and four-laning of the route west from Aurora. Efforts by the northern alignment group continued unsuccessfully to the Bureau of Public Roads hearing held on July 26, 1961 and location approval of the Evansville area route. Connecting Indiana with Kentucky, the double decked Sherman Minton Bridge (a dual suspended arch bridge) carries Interstate 64 over the Ohio River. It was completed and opened to traffic in 1961.7 The span was closed between September 9, 2011 and February 17, 2012 for emergency repair work when cracks were discovered in two supporting bridge members. With upgrades at the Kennedy Interchange completed as part of the Downtown Crossing project, the idea of removing I-64 from the Ohio River waterfront is very unlikely. 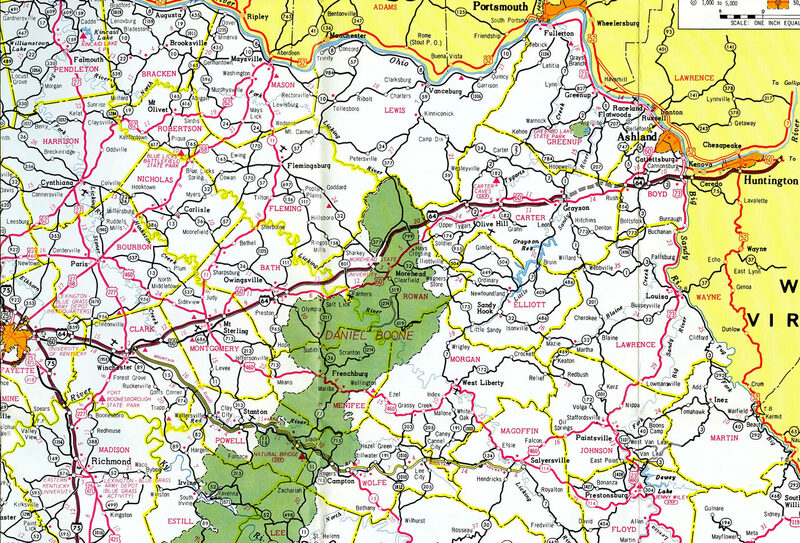 Interstate 64 was initially completed east of Beckley, West Virginia in the White Sulphur Springs vicinity. 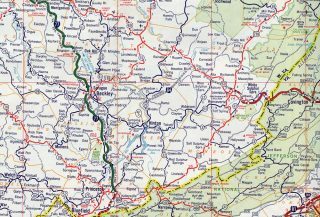 The route was finished in West Virginia by 1988. 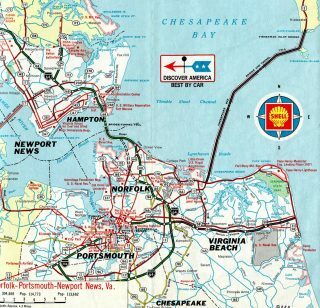 Hampton Roads, Virginia – 1969. This map shows a slightly different alignment then was ultimately built for I-64 across Willoughby Bay. Interstate 64 concludes at a shared endpoint with both Interstates 264 west and 664 south. Parallel U.S. 13 & 460 (Military Highway) tie into the confluence at Bowers Hill just to the west. Photo taken by Tony Payne (04/00). The freeway mainline turns west onto Interstate 664 north as Exit 299B while Exit 299A joins Interstate 264 east leading through the city of Portsmouth. Photo taken 03/01. All ramp connections at the three-wye interchange between Interstates 64, 264 and 664 feature shield assemblies for the respective ends. Photo taken 03/01. Interstate 64 inner ends as I-664 north begins. This is the only occurrence within the Interstate system where a parent 2-digit Interstate route concludes at a branch 3-digit route. Photo taken by Tony Payne (04/00). Traffic merges onto Interstate 664 south from U.S. 58 & 460 east ahead of the three wye interchange (Exits 15A/B) with I-264 east and I-64 outer. Photo taken 07/28/13. U.S. 13 north & 460 east join I-664 south briefly to make the connection with U.S. 13 (Military Highway) north. Exit 14 parts ways just ahead of the separation of I-664 south to I-264 east for Downtown Portsmouth and Norfolk and I-64 outer southeast to Chesapeake and Virginia Beach. Photo taken 07/28/13. I-664 south defaults onto I-264 east as Exit 15B turns southeast onto Interstate 64. U.S. 13/460 (Military Highway) parallel I-64 just south through the exchange at Exit 297. Photo taken 07/28/13. Replaced guide signs posted at the last Interstate 664 southbound exit for U.S. 13 north & 460 east onto adjacent Military Highway (Exit 14). This ramp serves the Bowers Hill community. Photo taken by Jonathan Lebowitz (08/02). These Highway Gothic based signs were swapped out for new signs by 2011. Interstates 64 and 264 cross one another again in 13 miles at Virginia Beach. Photo taken by Jonathan Lebowitz (08/02). U.S. 58 & 460 separate with a two-lane ramp for I-264 east to Portsmouth and I-64 outer to Virginia Beach. A loop ramp follows from the US highway mainline for I-664 leading north to Newport News and Hampton. Photo taken 07/28/13. This set of signs posted at the U.S. 58 & 460 off-ramp for I-264 east and I-64 outer, was carbon copied with new panels using Clearview font after 2008. Photo taken 12/17/01. Interstate 64 ends at an elongated interchange with left ramps, including Exit 1A for I-70 & U.S. 40 west to Columbia and Kansas City. Exit 1B departs for I-70 east through O’Fallon and St. Peters. U.S. 61 extends the freeway northward through Wentzville en route to Hannibal. Photo taken 04/13/13. Full coverage of the ending Interstate 64 west posted at Interstate 64-U.S. 40 West & 61 North – I-270 to Wentzville on AARoads. Interstate 70 and U.S. 40 east split at the directional cloverleaf interchange (Exit 210) with I-64 east and U.S. 61. U.S. 40 joins I-64 & U.S. 61 east through Chesterfield and Creve Coeur while I-70 stays to the north through O’Fallon and St. Charles. Photo taken 04/13/13. More photos covering the eastbound beginning of I-64 from I-70 east posted at Interstate 70 East – Wentzville to Maryland Heights on AARoads. Interstate 64 was previously extended west from Missouri 94 (Exit 10) to Highway K (Exit 9). Exit 9 consists of a slip ramp onto a collector distributor roadway linking the two interchanges. Photo taken by Brian Dowd (01/31/04). Following the westbound c/d roadway, traffic partitioned for Highway K to O’Fallon and the ending Interstate 64 west toward Wentzville. The parclo interchange with Highway K opened to traffic in early 2004. Photo taken by Jason Oesterreicher (06/18/04). An end sign for I-64 stood beyond the entrance ramp from Highway K entrance ramp to U.S. 40/61 westbound. A similar assembly was eventually added for I-64’s end at I-70. Photo taken by Brian Dowd (01/31/04). I-64-U.S. 40 east & U.S. 61 south just after the Missouri 94 entrance ramp. 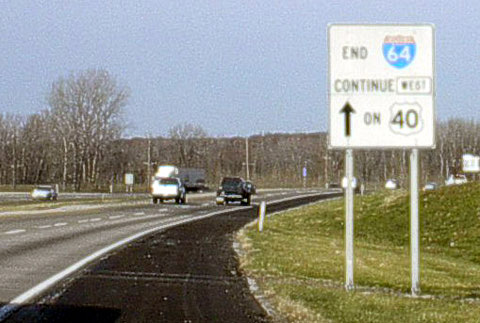 An older sign assembly with a “TO” banner above I-64 preceded the succeeding confirming marker for the then-newly designated stretch of Interstate. Photo taken by Brian Dowd (06/02). The previous first eastbound shield assembly for interstate 64, posted after the parclo interchange with Missouri 94. Photo taken by Brian Dowd (06/02). “Plan would erase I-64 from downtown: Bridges proposal faces uphill battle” by Chris Poynter, Louisville Courier-Journal, Friday, November 25, 2005. The Ohio River Bridges Downtown Crossing, http://www.kyinbridges.com project web site. “I-65 drivers brace for three year narrowing of Hospital Curve.” WHAS, July 8, 2013. Ripple, David Alan. History of the Interstate System in Indiana: Volume 1 – Chapters I-IV: Development of the National Program. West Lafayette, IN: Joint Highway Research Project, 1-1975. Print. “EMPORIA BYPASS WAS FIRST SMALL STEP.” Richmond Times-Dispatch (VA) October 6, 1991.